Spring Breakers is a Riefenstahl-esque, Malickian, Skrillex-soundtracked re-imagining of Joseph Conrad’s Heart of Darkness. But instead of ‘uncivilized’ Africa, we have St. Petersburg, Florida, a top destination for our continent’s debt-ridden youth to line themselves up and shake what their gyms have given them. And instead of Marlowe meeting Kurtz it’s four, relatively indistinguishable, infantile coeds going to a beach side concert by Alien (Franco), those five characters serendipitously meeting and re-separating because of the four’s inadvertent self-ingratiation into jail, the marijuana trade, and gang shootings. Spring Breakers benefits from TIFF and SXSW hype, screenings flocked by men who are ‘familiar with arthouse exploitation,’or as Rachel Korine’s character says to sweaty jockstrap-clad fratbros, men who are ‘never gonna get this p***y.’ But can this B-movie indie trash survive mainstream audiences? 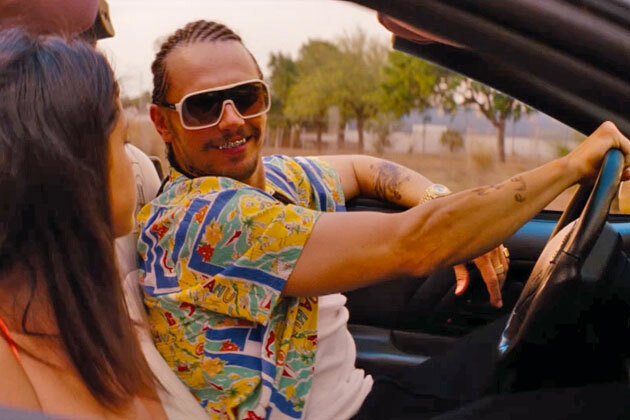 The movie’s notorious for what it shows, half of the critic world already deriding Harmony Korine’s directorial choices. I’m arguing that despite of Korine’s troll-like intentions, the movie intelligently brings up interesting points about contemporary young Western sexual culture. Despite the hype and promises of a poppier movie, this movie still feels as dirty as his earlier stuff. There’s the one-minute t***y montage, this over-stimulation cushioning its supposed sexual impact (but then again I’m not straight so I wouldn’t know). Body parts aren’t the only things that we are bountifully and apathetically bombarded with. Almost every scene begins and ends with a gun cocking or Alien saying the words ‘Sprang brayek,’ the sun sinking down the Gulf of Mexico again and again, every line repeated but reenacted differently. These repetitions aren’t the most enjoyable experience theatrically, but we understand a sense that our four girls want to never forget the longest week of their lives. Casting Hudgens, Benson and Gomez is an inspired decision. Maybe I’m talking about their Disney-filled CV’s although that’s not the first conscious thing in my mind. They’re between the ages of 19-24, old enough to go to college, but even if Korine shoots them in an equally exploitative eye, we as the audience still subconsciously feel like they’re dwarfed by everything around them. The three scooter around St. Pete with brazen vulnerability, adding more meaning to a vapid ritual. Korine gives Gomez an easy role as the religiously ambivalent Faith, and as anyone would, she comically evinces discomfort as Alien creepily romances her. Hudgens shows slivers of affection befitting both a cherub and a P***y Riot-masked succubus. Ashley Benson has less to do, since she sometimes looks indistinguishable from Harmony’s non-Disney wife Rachel Korine, but there’s a Central European-esque toughness in her face that hints of a future action starlet if she plays her cards right. And Franco, who played a Disney anti-hero this month, inserts human warmth into a caricature, almost saving the movie when he’s given permission to do so. The five are naturals, letting us have fun watching and listening to them, especially when singing Britney Spears. The singalong almost made me forgive the tedium in between.